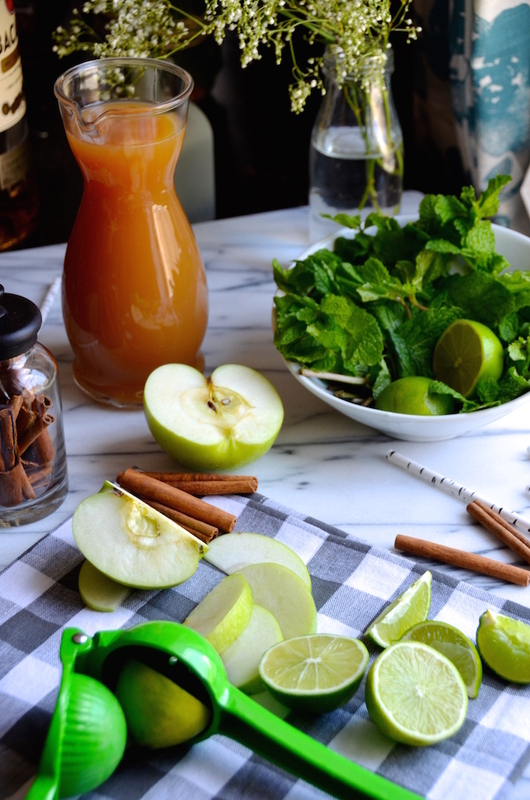 This is how we drink mojitos during the winter: local apple cider, warm winter spices like cinnamon and clove, fresh mint, and limes. It's a seasonal twist on the drink that so often fills my glass throughout the sweltering summer months. And while I still (and will always) prefer sweltering to freezing, it's a lovely way to help the frigid months go by. I actually served this easy cocktail at the baby shower I hosted for one of my very best friends this past weekend. The theme was cozy and wintery, so it was a perfect match. My friend's name is Mónica, though I've always called her "Moe," for short. At the party we called these "Moe-jitos," and fortunately they were delicious enough that people forgave me for (and even laughed at!) the awful pun. 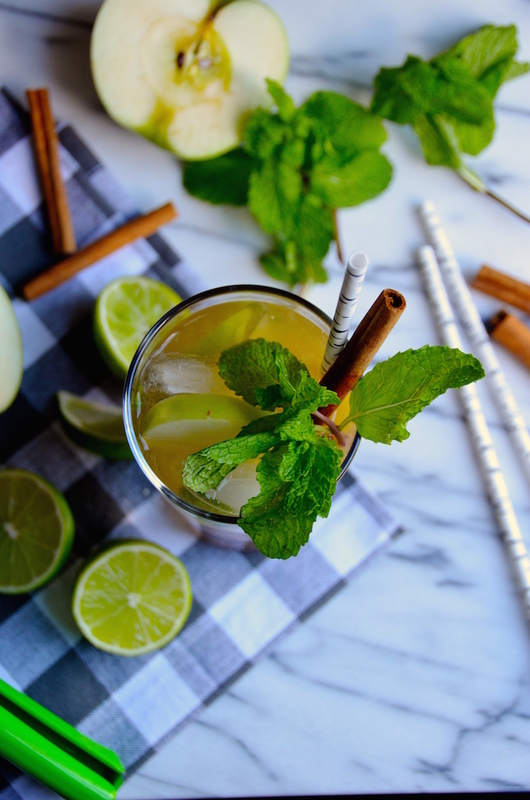 The drink starts just like other mojitos, muddling together fresh mint, rum, and lime. But gets a warming twist with the use of the more richly flavored gold rum (instead of the lighter white) and spiced apple cider. It might seem like a bit of an unusual combination, but the flavors all work beautifully together. It's an easy one to pull together in large pitchers if you're entertaining a crowd, or to just whisk up for yourself if you're craving something special. 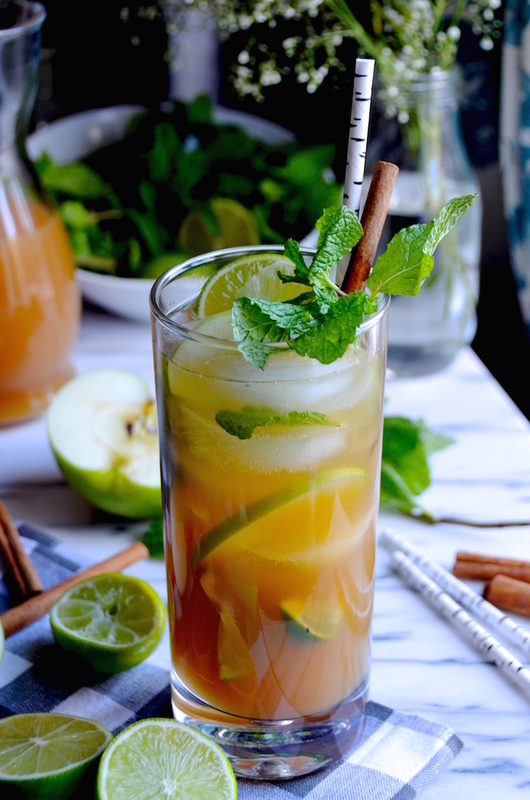 In the bottom of a tall cocktail glass, combine rum, lime juice or wedges, and mint leaves. Use a wooden muddler or the handle of a wooden spoon to mash together for a few seconds. Add ice, then pour in apple cider until it reaches the top. 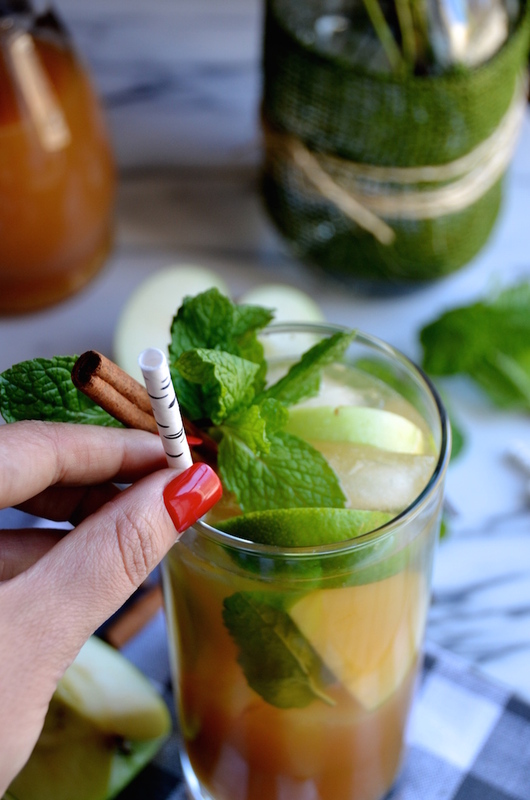 Garnish with a cinnamon stick, apple slices, and a sprig of mint.